Do you want to do something awesome for literacy week? Check this out! 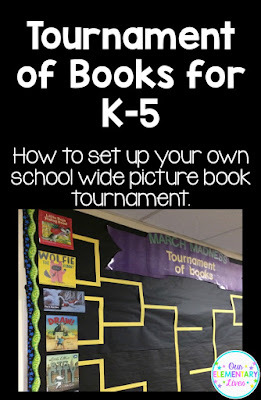 Your students are going to love it and everyone is going to be pumped for your school wide book tournament. Hi! 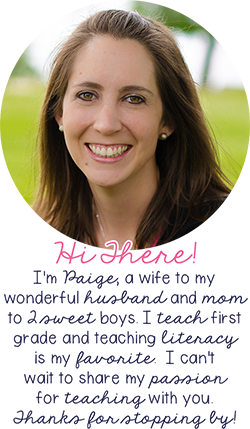 I’m Jeanette, a second grade teacher! 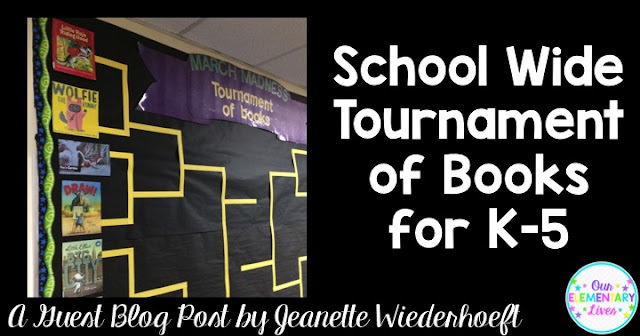 I am so excited to be guest blogging to share with you all about our School Wide Tournament of Books for K-5. Our school has done this the last three years during literacy week and it quickly became an all school favorite. I usually start planning for the tournament in early February to be ready for Literacy Week at the beginning of March. It begins with talking to the school librarian to help with book selection. She pulls around 30 newer picture books from our school library that she knows will be popular with kids but haven’t been discovered yet. This year we asked her to include some award winners and culturally representative books as well. She always includes a few wordless books too. Then I work with the reading specialist to narrow the books down to our Sweet 16 that will begin the competition. We consider titles that will appeal to students K-5, the time it will take teachers to read them aloud, the number of copies we can get of each title and good match-ups. Our librarian then reserves multiple copies from around the district and we rubber band the competing match-ups on a special cart in the library for teachers to grab from. Now the fun begins! I share the list of books with teachers the week before Literacy Week. Sixteen extra read alouds is a lot to fit in around books you may already be reading to support curriculum so we want to make sure to give plenty of time. Our librarian is always willing to help out classroom teachers by reading a title or two during her time with students as well. This is also the time we put up our school-wide bulletin board to promote the Tournament with students. We put it on a wall near the office in the middle of the school so it can be viewed by everyone. The bulletin board looks like a March Madness bracket and displays each set of competing books with a copy of their book cover. The conversations we hear kids having around this bulletin board discussing their predictions is one of the best parts of the Tournament of Books! Here's the bulletin board ready to go. We have used the same materials for all 3 years, which makes it really easy. All we have to do is copy the book covers. Each classroom teacher gets a Sweet 16 ballot during Literacy Week. 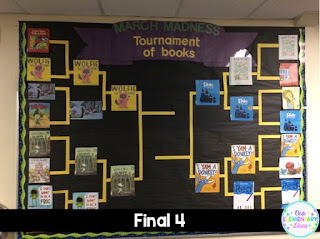 In my classroom I read a competing matchup (2 picture books in the same part of the bracket) and we have a class discussion about what we liked about each. I love hearing my students talk about their opinions of each book and encourage them to support them with details from the book (It’s great practice for our upcoming persuasive review writing unit!). Finally I take a traditional eyes closed, hands up vote on their favorite. I circle my classroom winner on our ballot and continue this process throughout the week until students have heard all 16 books and have voted on their 8 favorites. At the end of Literacy Week the Sweet 16 ballots are due. 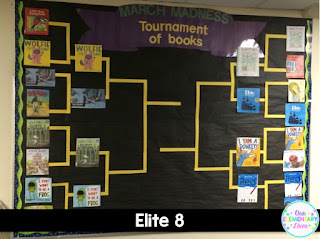 The favorites from all of the classrooms are tallied and the Elite 8 books moving on to the next round are revealed on the school announcements and on the bracket bulletin board. 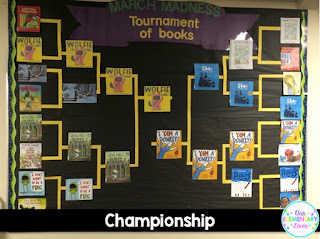 The Tournament of Books continues through March with the champion book revealed right before Spring Break. Since teachers have less books to read and don’t necessarily need to reread all the remaining books (although most of the time the kids beg for it), there is a shorter turnaround between the remaining rounds. About 4 days to vote on the Elite 8, 3 days for the Final 4, 2 days to narrow it down to the 2 books in the Championship Round and then 1 day to vote on the Champion book. It wouldn’t have to be exactly that time frame but that has worked for us trying to finish before Spring Break. Before each new round teachers are given a new ballot with new match-ups. The books moving on in the Tournament of Books remain on the special cart in the library but I update the competing matchups and remove the titles that didn’t win. If teachers don’t want to reread all the remaining books or just don’t have time, I send out a document with pictures of the competing titles for teachers to show kids before voting to make it easier to remember each book. This is the process we have used the past 3 years but next year we are planning to try voting through Google forms to streamline the voting and reduce the number of paper ballots to keep track of. Another fun addition we do to foster excitement about the Tournament of Books is a picture book raffle. 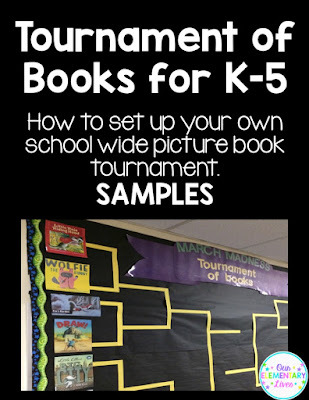 We purchase many of the Sweet 16 titles competing in the Tournament and each day a classroom is picked to choose one of the books to keep in their classroom library! 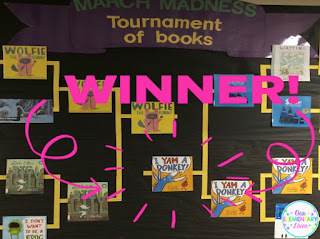 This year I Yam a Donkey by Cece Bell was our champion! A Perfectly Messed-Up Story by Patrick McDonnell and The Day the Crayons Quit by Drew Daywalt were the winners from previous years. At our school the funny ones always seem to be the favorites! 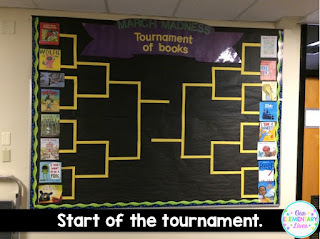 I would love to hear how this goes at your school and which book your students pick as the champion! I have included samples in this PDF. Click on the picture below to see our sample letter to teachers, ballots and bracket. You will need to create your own as it will be very different because of the books you choose, but please use these as a template. I also just came across this website, where you can create your own bracket. All you have to do is type in the book titles. That would be a lot easier than putting in the book images like we did. Although ours is geared to K-5, so the images were great for our younger students. Check out the website! Here are pictures of our school-wide bracket bulletin board throughout the process. For easy pinning, I've created the image below. Click on the picture to repin. Thank you so much for stopping by. Have you done this in your school or with your class? I'd love to hear, please share in the comments below. Oh my gosh! I love this idea! This would be perfect with March Madness which is also around the same time as Reading Week. I'm going to definitely suggest this at my school. Thank you! What an awesome idea! We are getting ready to do our own tourney in March, thanks to your post!